As in every kindergarten, our teachers use hand and body movements while singing children’s songs in circle time. However, in our school, most of the gestures we use in songs are actual signs taken from Israeli Sign Language. Choosing actual signs as our song gestures, gives our students the opportunity to be exposed to a larger vocabulary in a consistent repetitive way, facilitating generalization and adoption of those signs into daily communication and expression. In the last few years, in order to encourage the use of sign language at home, the kindergarten teachers and speech and language therapists created WhatsApp groups instant group messaging app), that include parents from the kindergarten. Initially, one teacher would film herself singing a circle-time song using the gestures and send it to all the groups. Over the years, the groups’ use and purpose continued to evolve. Following feedback form parents and children, we realized the children most enjoyed the videos with their own teacher in them, so currently we try to make sure that each teacher films herself performing the song and send the video to her own group, or the teachers perform it together and send the video to everyone. The Kindergarten teacher’s message is in green. The moms’ responses in white. Mom#1 : Wonderful!! Thanks! Mom #2: My phone is wet from A’s kisses. LOL. Thank you so much! 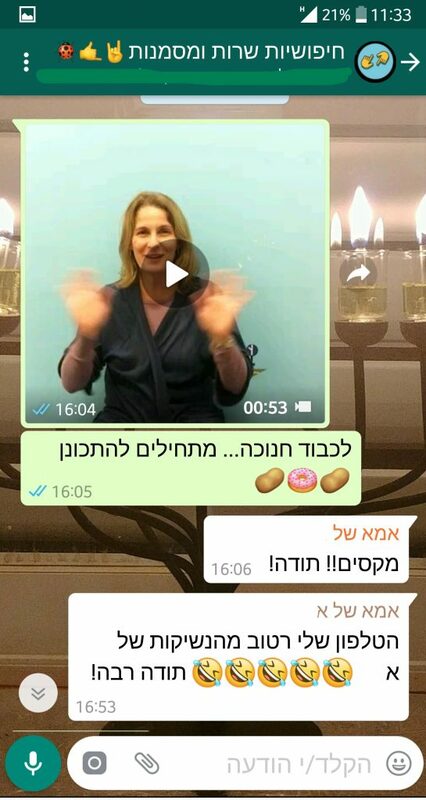 In the next week, we are celebrating a holiday for the trees (Tu B’Shvat), and below we have shared two videos that were sent in the kindergarten WhatsApp groups with songs for the holiday. In the second video, the kindergarten teachers are using signs and communication symbols in the song. A true AAC experience. Using recordable buttons and symbols, we have displayed the song in sequence in the hallway at school, so the kids can sing the song whenever they pass by.